A simple and easy idea to make waves. Just toss some of these into your decoy spread and watch the action. Constant movement adds in ripples like real ducks. Rattling Bag Product #: 00177 Tuned hardwood elements in a durable, REALTREE® camo bag produce the authentic sound of battling bucks. It includes a lanyard for easy carrying and one-handed operation. With silencer strap for quiet transport. Instant set-up, ultra light, holds scent, durable, hangs from a branch or free stands. 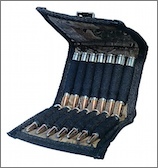 Don't Loose another shell; Tri fold camo pouch holds 14 rifle cartridges. Roger Raglin Hands Free Buck Call. Now available from Roger Raglin products, hands free Buck calls. Made by Modern Call Products the originators of the hands free calling system. Roger Raglin Hands Free Doe Call. Now available from Roger Raglin products, hands free deer calls. Made by Modern Call Products the originators of the hands free calling system.